Get Quality Golf Tees Here. Before your next round on the golf course, pick up a pack of quality golf tees from LostGolfBalls.com. We carry a variety of tees, including those made of wood and composite, and 2-3/4" sizes. Looking for colors? Our colored golf tees come in red, yellow, pink, green, and orange, as well as white and brown. If you choose a bucket of 500 golf tees, you may receive tees in blue, dark green, and black as well. All of our tees are durable and reliable. 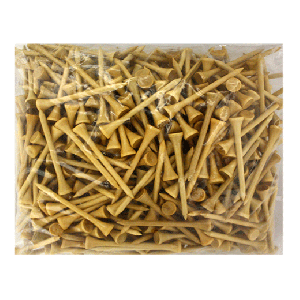 Golf tees for sale from LostGolfBalls.com are rated 4.9/5 stars by our satisfied customers.